The neighborhood surrounding Portland’s Keller Auditorium is undergoing a renaissance fueled by private development and renovation of Halprin’s Portland Open Space Sequence. Yet the auditorium, with its imposing blank walls and shuttered daytime presence, remains an untapped resource for revitalization of this aging district. Mayer/Reed and Second Story propose design interventions to elevate the auditorium as an energizing nexus of the neighborhood. The vision utilizes experiential and urban design to transform the auditorium blocks into a “stage for everyday performances,” a place where reclaimed public space is infused with the vibrancy of performing arts. We envision SW Third Ave. as the “main stage,” a civic gathering place that connects the auditorium with Ira Keller Fountain. Closed for special events, the street becomes an extension of both the park and the performance hall. SW 2nd Ave, the “back stage,” becomes a more intimate festival street with an interactive art installation as a catalyst for re-energizing storefronts. This pair of programmable streets links to the Open Space Sequence. The concept extends to the Keller’s façade with a bold building signature and interactive architectural treatments that respond to people’s actions. At all times of day and night, interactive installations on the auditorium’s façade offer opportunities for pedestrian engagement. 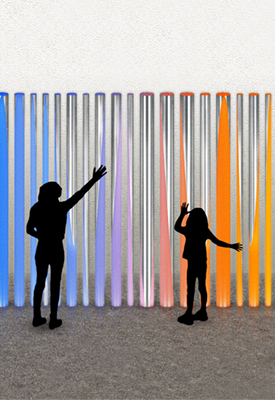 Color, reflectivity, fluid movement and play are dramatically expressed through light and sound. The result is a destination infused with identity, participatory installations and reclaimed public space, engaging people with the performing arts, the neighborhood and each other.